THE HAGUE - The first planeload of evacuees from the hurricane-ravaged island of Sint Maarten has taken off for Eindhoven. Around 100 people are being flown to the Netherlands from neighboring Curaçao. At the same time, 550 Dutch soldiers are traveling in the other direction to keep order and help with the relief effort in the wake of Hurricane Irma. Earlier on Monday King Willem-Alexander visited Sint Maarten accompanied by home affairs minister Roland Plasterk. The pair visited a hospital on Curaçao at the weekend where people injured during the storm are being treated. Plasterk dismissed criticism of the Netherlands’ response to the disaster, pointing out that hundreds of relief workers were dispatched to the island before the hurricane struck. ‘But what they can actually do in practice is the next question,’ he said. 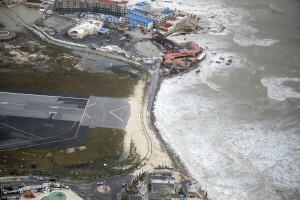 Efforts to relieve the island have been complicated by the widespread destruction, which has left Sint Maarten without a working hospital or public services. Large parts of the island are still without running water or a telephone network. The island’s airport was also badly damaged and is only accessible to aircraft that are able to land unassisted by air traffic control. Military personnel and members of the specialist aid team USAR.NL are working to deliver food and water supplies around the island. USAR.NL has previously worked in earthquake-hit zones in countries such as Nepal, Pakistan and Haïti.